West Coast builder continues to ride the outboard-power wave. 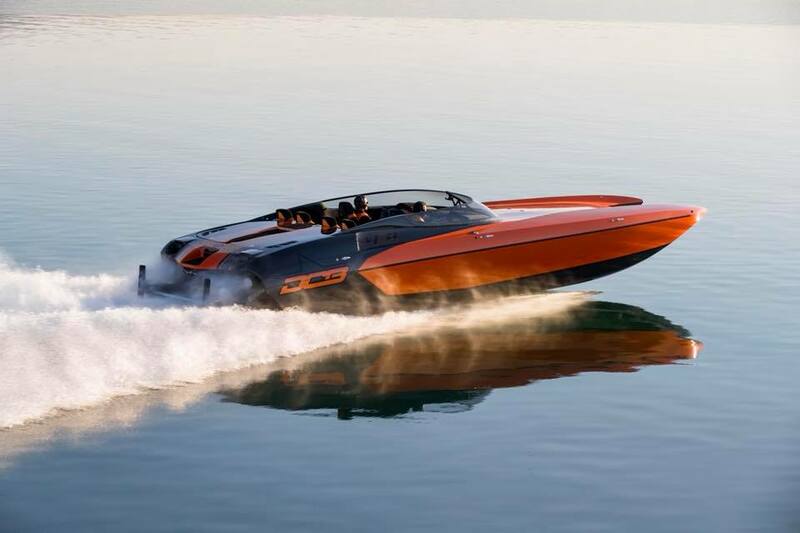 Though DCB Performance Boats had 14 catamarans on display at this spring’s Desert Storm Poker Run Street Party in Lake Havasu City, Ariz., it was the company’s smallest offering that drew the biggest crowds on McCulloch Boulevard, the high-octane desert town’s main artery. 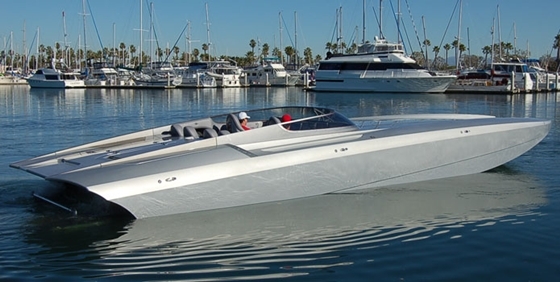 The crew at the El Cajon, Calif.-based custom boat builder finished the new M28, the latest addition to their wide-body “M Series” catamaran line, just in time for the all-day exhibit. 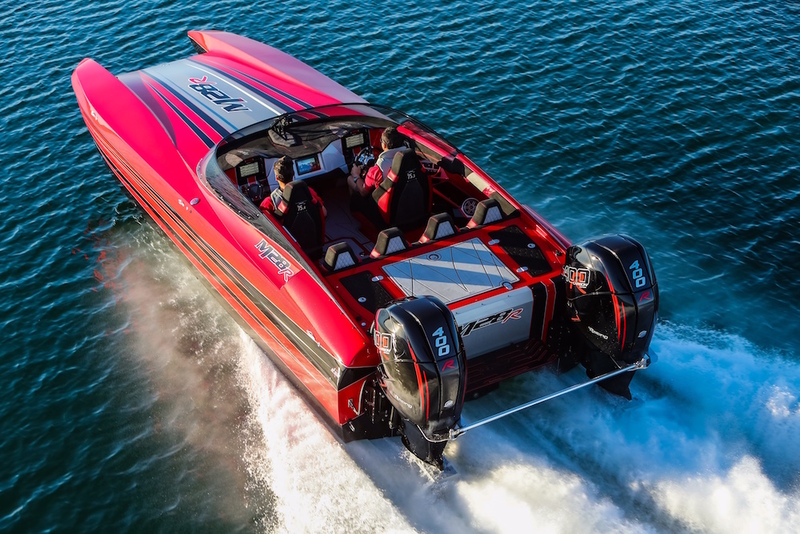 They water-tested the twin Mercury Racing Verado 400R outboard-powered 28-footer for the first time on Lake Havasu less than 24 hours before its unveiling. And their efforts were rewarded by the throngs of people ogling the boat throughout the event. The team at DCB is expecting their new M28 catamaran to top 120 mph. Photo by Todd Taylor. Before the M28 hit the street in Arizona, DCB’s M29 was the smallest M Series catamaran. (When complete this summer, the M44 will surpass the M41 as the largest offering in the line.) 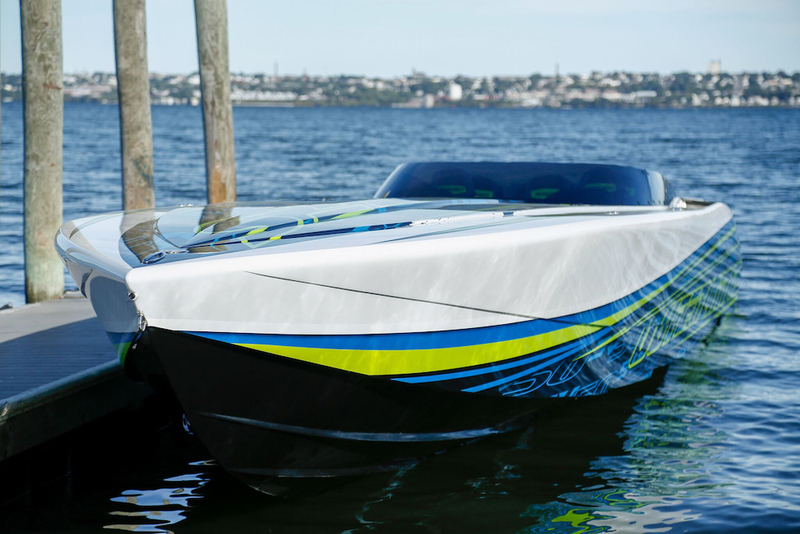 The company has built four M29s with Verado 400R outboard power for sales representative Scott Sjogren, who has sold them to clients in Chicago, Missouri, and Florida. Despite the relatively close dimensions of the two cats, the people at DCB aren’t worried about losing sales of one model to another. Orders for the M29 remain steady, and DCB has already pre-sold five M28s, according to the company’s Jeff Johnston. The first resin-infused M28 was laid up with carbon fiber and Kevlar. The builder mounted the 400 HP supercharged outboards on powerboat racer’s Shaun Torrente’s STR X-ACT Outboard Brackets. The cockpit is decked out with a SeaDek liner, and the undersides of the rear hatches also were finished with SeaDek material. For the upholstery, DCB used a fifty-fifty mix of Alcantara and Ultra Leather. Loaded with electronics for a performance boat its size, the six-seat 28-footer is equipped with two Simrad NSS9 Evo3 units, a Garmin 7608 GPS/chartplotter linked with a Garmin VIRB mounted on the primary windshield support bracket, and a Stage III stereo system. LED lighting is generously distributed throughout the catamaran’s cockpit. Still in the process of “dialing in” the M28, DCB’s team members were pleased with the results of its first test session, which involved Johnston, DCB’s Tony Chiaramonte, and Mercury Racing product manager Mike Griffiths. “We didn’t push for a big number—we were just getting started testing—but we’re expecting to get 120 MPH out of it,” said Johnston. Chiaramonte, who spent time behind wheel alongside Griffiths, described the M28 as “one of the best-handling outboard boats" ever built by DCB. Once its testing and setup are complete, the first M28 will be delivered to a longtime DCB client in Canada.